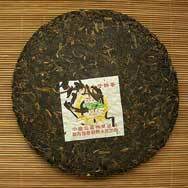 This Tribute grade Pu'er tea cake is one Li Ming Tea Factory's flagship product. 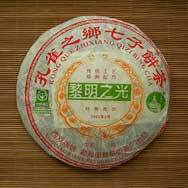 Its name means "Glory of Li Ming", and Li Ming has high hopes for this tea, marketing it aggressively and set it as a benchmark for future tea cakes. 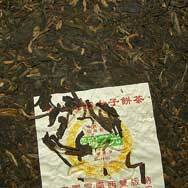 Even though it is still relatively young for a raw tea cake, the tea leaves are already showing signs of good aging.